A Tailgater in GTA V.
"Look at this car and ask yourself what price would you place on style, status and sophistication?" - Simeon Yetarian, official GTA V website. 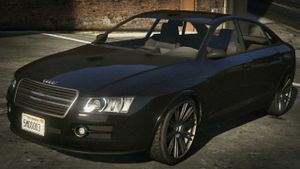 The Obey Tailgater is a four-door sedan featured in Grand Theft Auto V.
The Tailgater mostly resembles the 2004—2011 Audi A6 with some elements from other European cars. The Tailgater's name is likely a reference to the perception that Audi drivers tend to tailgate, especially in the United Kingdom. With a V6 engine, the Tailgater has a good top speed and acceleration. Traction is acceptable at low to moderate speeds, but it begins to understeer at higher speeds without using the brakes. Without performance upgrades and special abilities, the Tailgater is electronically limited to a top speed of 111 mph (179 km/h). The Tailgater does not spawn in normal traffic in GTA V under normal circumstances. Occasionally found at the Los Santos Golf Club. A unique yellow Tailgater is seen parked in the Premium Deluxe Motorsport showroom in Complications. Michael can drive one away after the mission if he chooses. Two Tailgaters will be left near Devin Weston's hangar at the last checkpoint of Eye in the Sky. Franklin is instructed to drive any one of them out of the airport to complete the mission. In the Strangers and Freaks mission Unknowing the Truth, Michael is required to drive a unique baby-blue Tailgater with custom number plates reading K1FFLOM. Michael can keep the Tailgater should the player choose to break away from the convoy and not deliver the money. Pre-release for GTA V (Rear quarter view). This page was last modified on 5 February 2015, at 02:45. [38ce5c5b5c233c8b1c8ec319] 2019-04-20 23:04:14: Fatal exception of type "Wikimedia\Rdbms\DBConnectionError"